When I first started Horizon: Zero Dawn, I didn’t think Guerrilla Games’ version of a post-apocalypse saga was going to pull me in. Twenty hours later, I can’t stop hunting—and getting wrecked by—robot animals. It’s a very good video game with a chilling, scifi vision of the far-future at its core. Out next week, Horizon: Zero Dawn (a PS4 exclusive) puts players in control of Aloy, a young outcast with no birth mother, believed to be cursed by the matriarchal tribe of the Nora. She’s raised by a man named Rost, who teaches her how to hunt and survive in the wild. The unanswered questions of her past pull her into a vast open-world environment where mechanical beasts of all shapes and sizes roam. It’s a world that’s reverted to pre-industrial hunter-gatherer societies, centuries after a near extinction-level event. The main thing I like about Horizon: Zero Dawn is how it opens up in an inviting way, constantly revealing layers of mystery and abilities that you want to dive into. 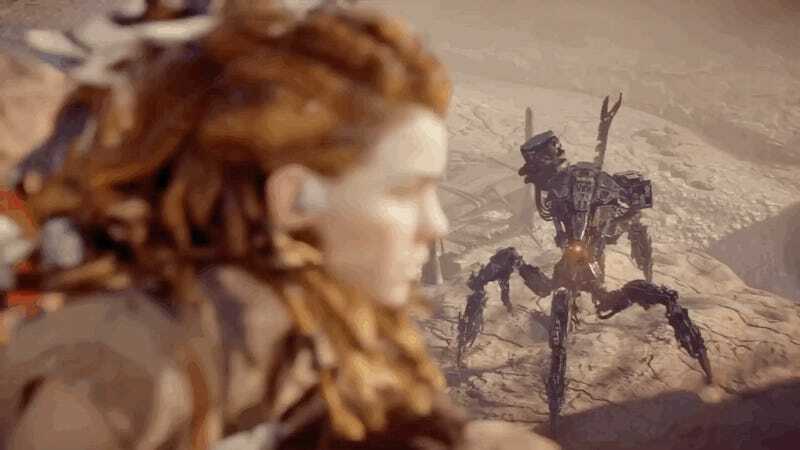 The main storyline has Aloy exploring the world she inherited, working to uncover what happened to make things this way and the mysterious origins of the robotic lifeforms roaming the landscape. With the aid of an ancient scanning device called a Focus, Aloy can track humans, animals, and machines. The mechanics are reminiscent of the new Tomb Raider games; there’s a loop of foraging and hunting in lushly detailed environments and a taxonomy of wildlife that you can hunt for various resources. It’s that wildlife that makes H:ZD feel exciting and foreboding. Moving through its environments really does feel like you’re exploring a post-apocalyptic landscape with its own ecosystem. The robot lifeforms that populate the landscape resemble horses, deer, and cattle just enough to feel familiar. Some travel in herds, stampeding across a plain while others stalk hillsides solo. Even though her Focus reveals weak spots on each species of robot, they still feel unpredictable and inscrutable. The first few fights against a Scrapper, Longleg, or Sawtooth all felt excruciatingly tense, tests where I learned what I and they were capable of. The skirmishes all hewed to standard video game enemy AI design—creating patterns and exploits to let players defeat each enemy type—but the plenitude of these lifeforms keeps things fresh. Better than fighting the robo-beasts yourself is happening upon them fighting other humans. These instances make it feel like the world is living on its own, and that Aloy is just a small part of a cycle of life and death. As for the main character herself, I particularly like that her heroic prowess comes in part from attempting to recover the scientific knowledge lost to humanity. Yes, she’s searching for answers about her own past, but in a world where most people shun technology, the fact that she’s trying to understand what came before is significant. Prior to this game, Guerrilla was a developer with tons of technical savvy, a shop that created the Killzone games which were some of the best-looking titles for the PS2, PS3, and PS4. But for all their technical prowess, the storytelling and world-building always fell flat for me. Horizon: Zero Dawn turns that around in a big way. The structure of H:ZD manages to weave a set of very familiar dystopian scifi beats and game design choices into something that feels fresh. After the game’s awkwardly earnest start, you begin to learn about faction tensions and political intrigues. In the game’s many side quests, you’ll encounter cultures clashing with each other and skeevy vendettas floating to the surface. People will alway have things to fight over, even after the world as we know has ended. What Aloy and her peers call the ancient past is our near-future, a reality where amoral technological advancement and corporate triumphalism royally screw over the entire planet. As I played Horizon: Zero Dawn over the last week, I became more obsessed with learning more about the arc of modern civilization’s doom, mostly because the ingredients in this particular apocalypse come across as chillingly plausible. As you wander the landscape collecting the scattered accounts of the culpable and victimized, a multi-layered horror story comes into focus. If you shuddered the first time you saw videos of Boston Dynamics’ Big Dog robot in action, it won’t come as any surprise that Horizon: Zero Dawn leans on mankind’s hubris as the tipping point to unwitting self-destruction. 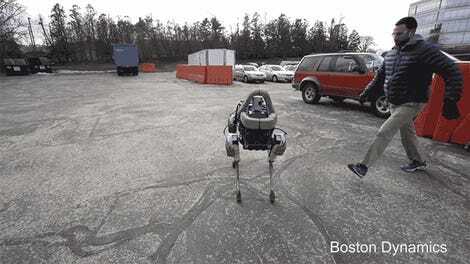 The robots prowling the game’s open-world environs are Big Dog’s descendants gone wrong—after being built to do the “right” things. As is often the case in good science fiction, humanity never realizes how tenuous its grip on the planet is until it’s long since out of hand. Don't. Stop. Cryin' 'Bout Tomorrow.